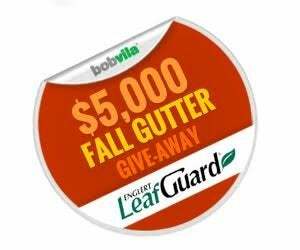 Enter Bob Vila’s $5,000 Fall Gutter Give-Away Today! Enter for the chance to win gutters and installation from LeafGuard! What if we told you that you never have to clean your gutters again? No, this isn’t a trick. With LeafGuard’s maintenance-free gutter system, you can prevent clogs, keep water flowing, and eliminate the possibility of damaging leaks to your foundation without having to waste your free time or risk your safety. Interested? Enter Bob Vila’s $5,000 Fall Gutter Give-Away and you could check this onerous task off of your to-do list once and for all. Today and every day this month (from noon EST Saturday, October 31st, through 11:59 a.m. Monday, November 30th), you can enter to win LeafGuard Brand Gutters and installation (up to $5,000 in value)—and say goodbye to gutter maintenance forever. See Official Rules below. LeafGuard by Englert is the only one-piece system of it’s kind, showcasing a leaf and debris shedding hood that boasts a large gutter bottom. Inspired by the scientific principle of water adhesion, the seamless design allows rain to flow down and around its curved hood and into the gutter, while also deflecting leaves and other unwanted materials. 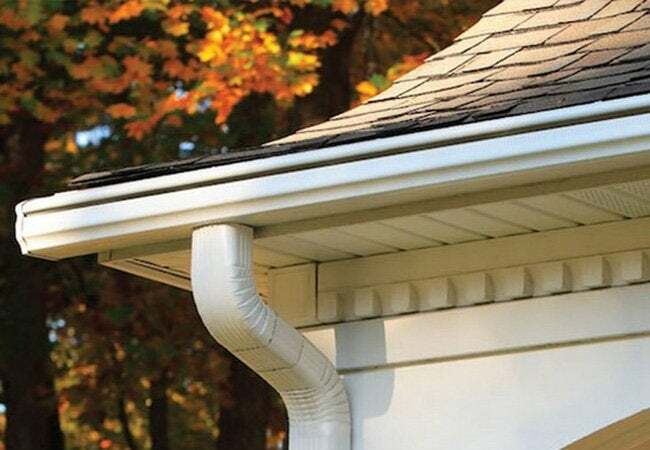 These hardworking gutters, backed by the Good Housekeeping seal, not only prevent clogged downspouts and the risk of damaging leaks, but they also ensure that you can put away the ladder—forever. Plus, LeafGuard gutters are available in a wide range of styles and colors, making it easy to find a system that complements your home’s exterior. So say goodbye to this seasonal chore, and enter Bob Vila’s $5,000 Fall Gutter Give-Away today and every day (through 11:59 a.m. Monday, November 30th) to increase your chances of winning. To learn more about LeafGuard gutters, click here. The “Bob Vila’s $5,000 Fall Gutter Give-Away” is open only to permanent legal U.S. residents of the 48 contiguous states and the District of Columbia; residents of Alaska and Hawaii are not eligible. Void in all other geographic locations. No purchase necessary. Void where prohibited. Contest Period runs from 12:00 p.m. (EST) Saturday, October 31st, 2015, through 11:59 a.m. Monday, November 30th, 2015. One entry per household per day on BobVila.com. Alternative means of entry for Drawing is available by faxing your name and address to 508-437-8486 during the applicable Entry Period. Odds of winning depend on the number of eligible entries received. See Official Rules.